Alveolar Ventilation rate (V'A), measured in ml/min, is the rate of air flow that the gas exchange areas of the lung encounter during normal breathing. The alveolar ventilation rate is a critical physiological variable as it is an important factor in determining the concentrations of oxygen and carbon dioxide in functioning alveoli. The relationship between the alveolar ventilation and the concentrations of O2 and CO2 in the alveolar air is intuitively intelligible. High rates of air exchange in functioning alveoli, that is higher alveolar ventilation, would bring in fresh oxygen-rich air and efflux carbon dioxide-laden air rapidly; consequently, the concentration of oxygen would be higher and the concentration of carbon dioxide would be lower within alveoli. Alternatively, low rates of air exchange in functioning alveoli, that is lower alveolar ventilation, would bring in fresh oxygen-rich air and efflux carbon-dioxide-laden air slowly; consequently, the concentration of oxygen would be lower and the concentration of carbon dioxide would be higher within the alveolus. The quantitive relationship between alveolar ventilation and alveolar gas concentrations are discussed in the alveolar oxygen and alveolar carbon dioxide pages. The alveolar ventilation rate can be calculated using the "Alveolar Ventilation Equation" described below. The alveolar ventilation equation takes advantage of the observation that all of the carbon dioxide exhaled by the body must come from gas exchanging areas of the lung, that is ventilated alveoli. It then normalizes this rate of carbon dioxide exhalation by the partial pressure of carbon dioxide in the alveoli in order to correct for higher or lower values of carbon dioxide present in the alveoli. Because in healthy subjects the partial pressure of alveolar carbon dioxide (PACO2) is equivalent to the arterial carbon dioxide (PaCO2), we substitute the arterial variable for that of the alveolar value. Given this substitution, the alveolar ventilation is proportional to the rate of carbon dioxide exhaled by the body (V'CO2) and inversely proportional to the PaCO2. We do no include the formal derivation of the alveolar ventilation equation although this can be found elsewhere. The Alveolar Ventilation Equation is instructive in understanding the influence of alveolar ventilation on the partial pressure of arterial carbon dioxide. For example, if alveolar ventilation (V'A) is doubled, the partial pressure of PaCO2 must be halved in order for the lungs to expel carbon dioxide at the same rate. Alternatively, if alveolar ventilation (V'A) is halved, the PaCO2 must double in order for the lungs to expel carbon dioxide at the same rate. Consequently, the alveolar ventilation equation makes clear that at a constant rate of carbon dioxide generation and elimination by the lungs, the modulation of the alveolar ventilation can powerfully affect the partial pressure of arterial carbon dioxide. The alveolar ventilation equation provides the fundamental relationship between the rate of alveolar ventilation (V'A) and the partial pressure of arterial CO2 (PaCO2). 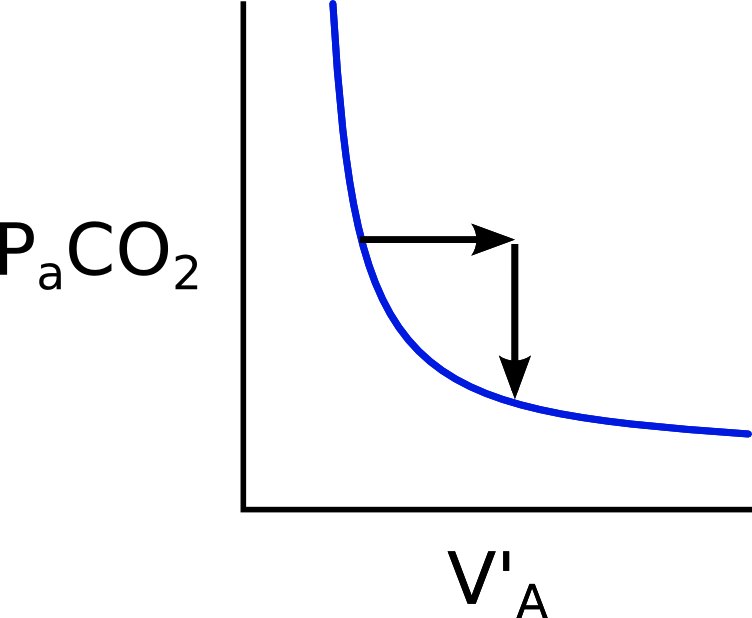 The graph above shows how the PaCO2 changes by varying the alveolar ventilation rate for a given rate of whole-body CO2 exhalation (V'CO2) As shown by the arrows, doubling the rate of alveolar ventilation (V'A) would yield a halving of the arterial CO2 tension. Conversely, reductions in the alveolar ventilation rate would yield a rise in the partial pressure of arterial CO2.